The 2011 Legislative session is in full swing with many bills now being heard by the different committees. Gordon Gibson has been busy following the activities and has testified on behalf of the State Grange on a number of bills. 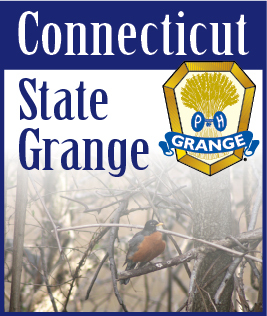 The testimonies have all been posted on the CT State Grange web site under the Legislative page – www.ctstategrange.org. I encourage you to check out our web site as we are adding new testimonies as they occur. The Legislative Committee is also on Twitter. Check us out at @CSGLegislative. We will post our testimonies or actions required on the bills as they occur. We have been watching several bills. One of the most important bills is HB 6262, An Act Concerning The Community Investment Program. There is a sunset provision of July 2011 which would terminate a portion of the program. This bill would continue the present distribution of funds generated from the Community Investment Act. These funds help correct the complicated federal milk pricing system which does not take into account the high cost of producing milk in Connecticut. Without it we would be in danger of losing many of Connecticut’s dairy farms. The dairy industry provides many jobs and contributes approximately $1.1 billion annually to Connecticut economy. This program also helps develop and sustain new farm developments. Another bill is HB 5203, An Act Authorizing an Agricultural Easement on the lands of the Southbury Training School. This bill would preserve more than 1300 acres of farmland at the Southbury Training School. The state already owns the land so it would not cost anything. Also, HB 6263, An Act Concerning The Transition From The Ten Mill Program protects owners of forest land enrolled in the “10 mill” program from having their land assessed at its highest and best use value over the next ten years. Private owners of forest land moved it over to this program and after 50 years, the land would be reassessed at its then current market value. The fifty year end date will be occurring soon for some of the forest land owners. This bill would allow those involved in the 10 Mill program to convert over to the “490 program” which was conceived after the “ten mill’ program was created. The “490 program” mandates that farm, forestry and open space be assessed and taxed at its current rate rather than best use rate. Another bill is, HB 6386, An Act Establishing The Department Of Energy and Environmental Protection. This bill was proposed by Governor Malloy and will combine the Department of Environmental Protection and the Department of Public Utility Control into one agency. Following the in footsteps of the previous bill is HB 5363 An Act Transferring The Conservation Functions Of The Department Of Environmental Protection To The Department Of Agriculture. This would transfer the Conservation and Preservation side of the Department of Environmental Protection back to the Department of Agriculture and restore the name Department of Agriculture and Natural Resources. It would enlarge the Department of Agriculture and move the parks, forests, wildlife, fisheries, land acquisition and conservation officers out of DEP. The Connecticut State Grange Legislative Guide has been published and copies were delivered to all of the General Assembly members. We also passed some out at the Agricultural Day at the Capitol. The deputies have been given copies for all of the Granges in their jurisdiction. If your Grange has not received your copy yet, please contact your deputy. Note: You can also download a PDF copy of the Legislative Guide by clicking HERE.